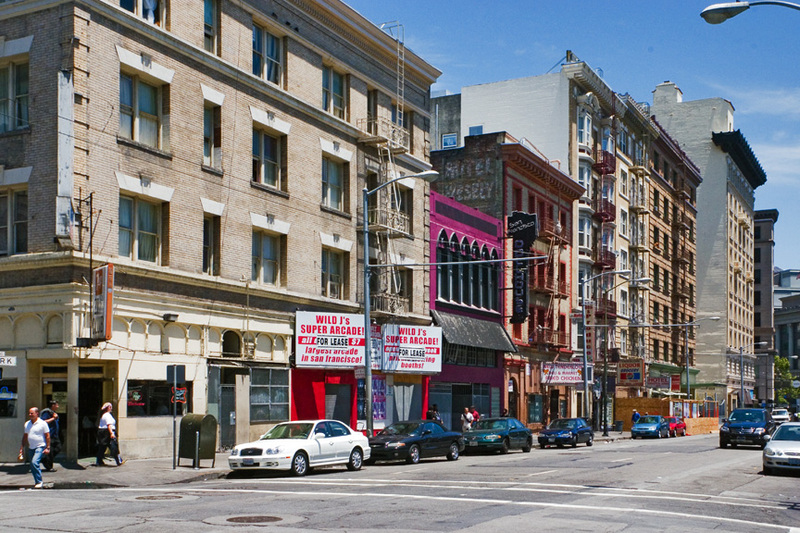 (340/18) 141–145 Eddy Street; Hotel Dunloe (1923), Hotel Zee (1984), West Hotel (2005). Rooming house with 129 rooms and thirty-nine baths. 5B stories; brick structure; ground floor pilaster order, three-story arched bays with keystones, galvanized iron belt course and cornice; three-part vertical composition; Renaissance/Baroque ornamentation; vestibule, lobby, and storefronts all remodeled. Owners: Gus and A.K. Harshall (1908), Vasilios Glimidakis (1967-1984), Tenderloin Neighborhood Development Corporation (2007). Architects: Cunningham and Politeo. 1908. Adjacent to the Hotel Ambassador is the renovated West Hotel, low-income housing owned and operated by the Tenderloin Neighborhood Development Corporation. Restaurateur Vasilios Glimidakis, “the Greek from Crete,” owned the hotel from 1967 to 1984, when around it flourished a little pocket of Greek cuisine and culture embodied by the Minerva Café (a taverna owned and managed by Glimidakis), the Golden Peacock, and Mike’s Bar and Mediterranean Café. Minerva Café, 1974. From 1967 until 1984, the Minerva occupied a storefront of the Empress Hotel, across the street from the West (then named the Hotel Dunloe). Golden Peacock Restaurant, 1974. The venerable and renowned Greek taverna was located at 173 Eddy, in a storefront of the Rosenbaum Building. Mike’s Bar and Restaurant, 1974. Mike’s occupied the corner storefront of the Bristol Hotel at Eddy and Mason. The hotel’s storefront is an adult theater that opened as the Aquarius in 1970, and in 1978 was renamed the Tea Room.